Skype on Verizon: A Big Deal or Not? any announced, claiming the apps didn't offer a good enough experience. 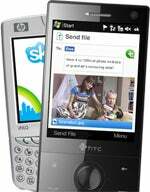 Although Skype has now removed Skype Lite and Skype for Windows Phones downloads from its site, if you already downloaded Skype onto your Windows Mobile phone, the application can still be used indefinitely. Outside the U.S., Skype for Windows Phones is still available for download for now. Mobile operators, though, are Skype's solution to a better mobile experience. On step in that direction is the company's new partnership with Verizon in the U.S., which brings the software on range of BlackBerry devices and some Android phones, including the Motorola Droid and Droid Eris from HTC. Under the new partnership, users can make and receive unlimited free Skype-to-Skype voice calls to anyone around the globe or call regular phone numbers at lower rates.